Picking the best soccer ball for your needs can be tricky. Different balls are designed for different purposes – and there are literally thousands of options on the market. In this guide, we’ll detail our picks for the 10 best soccer balls available in 2019, in terms of value for money. We’ll assess the durability, feel when playing, and overall quality of each ball we review. Adidas Brazuca 2014 FIFA World Cup soccer ball. In this section, we’ll review the top 10 best soccer balls for both kids and adults, including some great-value options under $50 you can use for training. Adidas gliders have an incredible reputation in the world of replica soccer balls. The MLS Top Glider features a soft outer shell similar to that of an official match ball, which is made of durable polyester. It also comes in sizes 3 and 4 as well as size 5, making it a great option for kids under the age of 12. This ball truly lives up to its name as a “glider,” having a stable flight path when shot and a nice feel when passed. The surface is relatively grippy, which is great for goalkeepers looking to practice their catches. Because the ball isn’t as slippery as some other replicas, you can shoot it with a little more swerve, and dribbling and skill moves are a bit easier. The only issue with this ball is that the panels are stitched, and they can come undone after a few years of regular use. However, Adidas balls are renowned for being well made in comparison to some of Nike’s older stitched-panel gliders – you should get a ton of gameplay out of this ball before it begins to lose its shape. Plus, the MLS Top Glider is very reasonably priced considering how well it performs on the pitch. Comes in size 3, 4 and 5. Feels slightly light (not necessarily a bad thing). If you’re looking for the best-quality soccer ball in terms of durability and consistency in flight, you can’t really go past the Telstar 18. This is the actual ball used in the recent FIFA World Cup. Basically, Adidas make a relatively cheap replica or glider ball, and then a better-quality version which is what’s actually used in professional matches – the Telstar 18 is the elite-level version. As a result, this ball is quite expensive – you definitely wouldn’t want to lose it, or let your dog chew it. However, its surface dimples result in greatly-improved aerodynamics, making it easier to place pinpoint passes, or shoot perfect shots. These bumps also allow for better grip, enabling you to effortlessly trap, control, and dribble the ball. The Telstar 18 is FIFA-accredited, meaning the weight is just right – but it only comes in size 5. This World Cup ball utilises thermally-bonded panels to stop water from entering the internals, and to prevent the seams splitting over time. It even has an NFC chip, which you can scan with your phone to bring up exclusive Adidas content. Easy to shoot and pass with pinpoint precision. Feels great to use – perfectly spherical, and the perfect weight. Thermally-bonded panels make for incredible durability. Need a tough ball, but don’t want to spend too much? In terms of durability, you can’t really go past Select. The polyurethane cover on the Numero 10 is tough enough to withstand dog bites and general wear and tear, but still feels nice and soft when kicked. Due to this toughness, it’s fantastic for indoor soccer or street games as well as outdoor matches. Although this ball is a bit more expensive than other replicas, it’s nowhere near as costly as the Telstar 18, and it comes with a two-year warranty for peace of mind when buying. This ball also retains its bounce quite well over time, making it perfect for practising volleys and clearances. Select’s ball design is fairly minimalistic – the front is just a white surface with their logo on it – in snow, it might be a bit difficult to spot. However, there’s a few different styles available, including orange and purple, which would better-suit winter conditions. The Numero 10 also comes with a special spot to mark your jersey number, which is helpful if there’s a few Select balls being knocked about at training. It’s also available in size 4, so if you’re buying for a kid aged 8-11 who needs a durable ball, the Numero 10 is a fantastic pick. The only downside to this ball really is that it might need to be re-inflated every few days or so. For most players this isn’t a big deal. Reasonable price considering its durability. Panels are still reasonably soft. Comes with a 2-year warranty, which is great to have. Will need reinflating every so often. This ball has two main differences when compared with the three others we’ve reviewed so far. First of all, it features fewer panels than most other replicas and gliders. Rather than going for a pure hexagonal/pentagonal mix, there are six large pentagons joined together with smaller square panels. Essentially, this means fewer bonds, and therefore fewer opportunities for the panels to come apart. It also makes it a little easier to strike the ball cleanly, provided you hit one of the larger panels. The second unique aspect of this soccer ball is the extremely bright designs on offer. You can get it in neon green, bright pink, and orange/marine. Having a bright ball serves two main benefits – the ball is easier to see in snow, and it’s easier to find if it gets lost in the woods or long grass behind the goal. Apart from that, this ball is everything you’d expect from the Adidas Performance range. The TPU cover is soft, without providing too much give, and the butyl bladder is incredibly leak-resistant. Although it’s very reasonably priced, we think the Starlancer V floats a little too much – it’s a slightly lighter ball, which is great for kids, but those aged 12+ may want something a little heavier. Very visible – won’t go missing easily. TPU shell with fewer panels – easier to find the sweet spot. Good price for an Adidas ball. On the slightly light side, especially in size 3/4. One of the benefits of buying from a smaller soccer brand such as Mikasa or Select is that the balls tend to be more durable. This is because these companies are more selective in choosing manufacturers for their products, because they rely on quality to maintain their competitive advantage. The Mikasa Serious is no exception, being one of the most durable but also one of the cheapest soccer balls for sale right now. It even comes with a one year warranty, which is quite surprising considering the price. However, this ball’s main selling point is its suitability for families with young kids. It features cushioned panels, perfect for smaller children. Despite this, the outer material still feels quite similar to most other soccer balls. This means that when your child grows older, they won’t have to adjust to the feel of a firmer ball. If your kids love to play soccer in the yard, or your child has just joined his or her first team, this ball is almost certainly your best bet. It even comes in sizes 3 and 4, making it perfect for little ones who are just beginning to learn how to dribble and control the ball. Occasional valve issues (although a 1 year warranty is included). Want the benefits of an official match ball without the hefty price tag? That’s what Nike are trying to achieve with their Strike 18/19 ball. Although it costs about a third as much as your typical official match ball, you still get aerodynamic surface dimples for better control, and a 12-panel design to make the ball more spherical. What you don’t get on this ball though are thermally-bonded panels – Nike have used machine stitching. Also, the Strike features a typical rubber bladder as opposed to an integrated carcass design found on more expensive soccer balls. Overall, this ball is an excellent mid-budget option. It’s very durable, and is particularly good at retaining its shape over the years. Passing and skill moves feel great (the bumps give you the grip necessary to elastico in any weather), and it’s not too light. The Strike is also quite easy to see in snow, especially in the yellow/crimson colorway. However, it is a bit more expensive than comparable Adidas replicas. Adidas Champions League ball in use by Cristiano Ronaldo. Image by Jan Solo licensed under CC BY-SA 2.0. This is another Adidas official match ball – the Finale 17 was used in the UEFA Champions League. As opposed to hexagonal, pentagonal, or square panels, you get a star-shaped design with this ball, as well as small bumps on the surface for improved grip in all weather conditions. The one thing to note about Adidas’s Champions League balls is they feel a bit harder than most other official match balls. It’s down to personal preference whether you’d prefer something with more give to it though – some people like these harder balls as they respond really well to strong shots. Another benefit of this harder feel is the durability on offer. The tough panels, butyl bladder and thermal bonds make for an almost indestructible official match ball. We’d still recommend keeping it out of reach of big dogs though. Of course, the Finale 17 is by no means cheap. But if you like how it looks, and don’t mind the harder panels, it’s a great pick for serious soccer players. Looks really nice – star-shaped panels. Feels a little hard, especially when shooting or clearing the ball. Under Armour haven’t been making soccer balls for a long time, but the Desafio 395 is actually one of the better options available at this price point. UA TOUCHSKIN™ technology provides an excellent first touch, while the ball’s black and yellow design ensures great visibility in all conditions. The Desafio is also renowned for holding air for months on end while also offering solid feedback when passed, volleyed, or shot. Because this ball comes in size 3, 4 and 5, it’s another fantastic option for youth players. Like the Mikasa Serious soccer ball, it’s also very cheap. However, it doesn’t come with a warranty. The only downside to this ball is its weight – it’s very light, even in comparison to the Adidas balls we’ve reviewed so far. While this can be a good thing for younger kids, it’s not so good for teens and adults, as the ball tends to float over the bar when shot. If you’re looking for something a bit heavier in this price range, we’d recommend the Select Numero 10 instead. Good feel when dribbling and passing. Excellent durability – solid stitching and high-quality valve. Bit lighter than most other balls. Want that classic black and white style? Or are you looking to buy balls in bulk? Wilson’s Traditional soccer ball is possibly one of the cheapest options for sale right now. But is it worth your money? Surprisingly, the durability is actually pretty good – the machine-stitched seams and butyl rubber bladder hold up pretty well. Obviously this ball isn’t quite as tough as most more expensive products. However, as long as you’re not absolutely smashing it, or using it on hard asphalt or concrete surfaces on a daily basis, you should be fine. Apart from the price, Wilson’s ball is great in that the weight is perfect. It doesn’t feel too floaty, but isn’t too heavy either. Plus, it’s available in size 3, 4, and 5, and there’s a decent level of cushioning to the panels. Ultimately, for kids, or for coaches who need a ton of balls, this is a great pick. Competitive-level adult players may wear this ball out quite quickly though. While the stitching is quite tough, the panels themselves may begin to break up if faced with extremely hard shots on a regular basis. Good level of cushioning in the panels. Probably not suitable for competitive players of high-school age or older. The Senda Amador quite literally has everything you’d ever want in a soccer ball. For starters, it’s nice and bright, making it easy to spot – no matter if it’s lost in thick grass or bushes, or if you’re playing in snowy conditions. Secondly, it’s reasonably priced, but also very durable. You get a 1-year warranty – Senda guarantee that the ball won’t lose its shape or succumb to split panel seams. The machine stitching is incredibly strong, and the bladder comes with extra protection against impacts which could otherwise cause leaks. Also, the surface is textured, just like on an official match ball, for better stability in the air, which is great for goalkeepers. You can still curve this ball with the right technique though. Plus, the cover is well-cushioned, allowing you to make an easier first touch. But the best thing about this ball is the fact that it’s Fair Trade certified. Meaning, you can rest easy in the knowledge that workers who made it received a fair wage for their efforts, and no child labor was used in the production of this ball. Allows for a soft touch, but isn’t too cushioned. None to mention – great ball for training. Now we’ll discuss some things to consider when picking the perfect soccer ball for yourself or your son/daughter. Why do different soccer balls feel different to kick? Most soccer balls are made with a butyl bladder (a type of synthetic rubber). However, different manufacturers have different ways of constructing the outer shell (which is what your foot impacts as you kick), resulting in different balls feeling very different to play with. Some will include a foam, typically EVA, behind each panel, resulting in a slightly softer feel. These are the best types of soccer balls in my opinion – they’re great for kids too in that they don’t hurt to toe-poke. Other balls will use a tougher outer material with less cushioning, designed to provide better long-term durability. What you get is down to personal preference. Just note that Adidas and Nike generally make the first type of balls – the ones with softer panels. 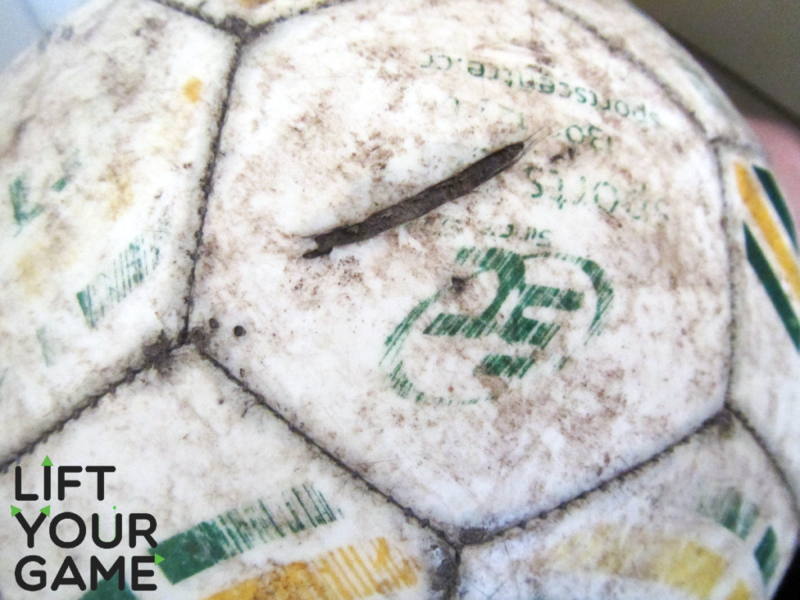 Just like people, soccer balls get cuts and scratches from everyday use. Be sure to pick a durable ball to ensure it lasts for more than a year. As we just discussed, if you want to avoid the ball developing scrapes in the actual panels (as shown in the image above), you want to get a ball with a tough polyurethane (PU) cover. However, there are other things to consider apart from the durability of the actual panels. First, there’s the quality of the seams in between panels. Normally the cover is stitched together – if this stitching comes apart, the bladder may become exposed, resulting in a misshapen ball. Unfortunately, it can be hard to tell how tough the stitches actually are on a ball before you buy it. The second thing to consider is the quality of the bladder, which is what you inflate to keep the ball nice and firm. If it begins to leak, the ball will become pretty much unusable, although minor holes can be fixed. Look out for butyl rubber bladders – they tend to be the toughest. To assess how durable a ball actually is, look at buyer reviews – prior customers are always going to let you know if a ball is prone to bursting after less than a year. I’m buying a ball for my son/daughter, what do I need to know? For kids, it’s important to get the right soccer ball size. Adults use the largest size (5) while kids use either size 3 or 4 up to the age of 12. Size 1 and 2 balls also exist, but they’re mostly used by toddlers or for practicing skills like juggling. Even if your child isn’t playing in an organized competition or league, it’s crucial to get the right size, otherwise they’ll struggle to control the ball. The other thing to consider when buying a soccer ball for your child is its weight. Generally, the younger your kid, the lighter the ball should be – smaller balls will weigh less. However, you don’t want something too light, otherwise it’ll feel like kicking a balloon, and your child won’t develop the strength necessary to shoot or pass full-size balls. How much should I spend on a soccer ball? Browsing online, you’ve probably noticed the massive difference in prices for the different balls out there. Some will cost as little as $10, while others will set you back $150 or even more. Anything that costs more than $50 is most likely an official match ball. Basically, Adidas and Nike make specialized balls for use in professional matches – they’re normally more aerodynamic (due to surface dimples), use thermally-bonded (as opposed to hand/machine-stitched) panels, and are made to FIFA weight guidelines – between 14-16oz, fully inflated. Official match balls feel incredible to kick, are very consistent in-flight, and are normally very durable, which is why they cost so much. If you’re serious about your soccer, and need a size 5 ball, these official match balls are definitely worth considering. Just remember though that if you spend this much on a soccer ball, you don’t want to lose it – if you train near a lake, road, or dog park for example, we wouldn’t recommend buying one. They’re commonly purchased by collectors, freestylers, or freekick specialists (due to how well they fly through the air). On the other hand, cheap balls will normally be made with a hand-stitched outer casing, which makes it more likely for splits in the panels to develop. They may also feel really light to kick. But obviously losing them isn’t such a big deal. Generally, it’s best to spend around $20-$40 if you want a good-quality ball that’ll last a long time and won’t feel too light. Don’t be afraid to spend more or less though depending on your specific needs – if buying in bulk for example, you’ll need to find something relatively cheap. Which is the best soccer ball brand? Nike Ordem IV about to be played upfield by Mariano Ferreira Filho of Galatasaray. We’re big fans of Adidas. Their balls are used in the FIFA World Cup and UEFA Champions League – the two biggest soccer competitions in the world – for very good reason. Adidas balls feel great to pass and shoot, fly true and straight (apart from the Jabulani!) and are normally very durable. Nike also make quality balls. Their products are used in many of Europe’s biggest domestic soccer leagues, like the Barclays Premier League. Nike balls are designed for consistency – meaning they won’t do anything you don’t expect them to. Other companies like Under Armour and Select are definitely still worth checking out though. Remember, no brand is perfect – consider each ball individually. But if you’ve had good experiences with a specific company’s balls in the past, feel free to stick with that brand. Do I need a ball pump? Yes. Most balls are shipped deflated. Also, you’ll need to pump up your ball every 2-3 weeks – it’s perfectly normal for soccer balls to leak air gradually. Unfortunately, most balls don’t come with a pump, so you’ll likely have to buy one separately. Some soccer balls are advertised as “training” balls – what does this mean? Different brands will have different definitions of what a training ball actually is. Normally, it means that the ball has a slightly softer feel to it, as manufacturers will include more EVA cushioning in the panels. Training balls may also be a bit lighter than game balls. 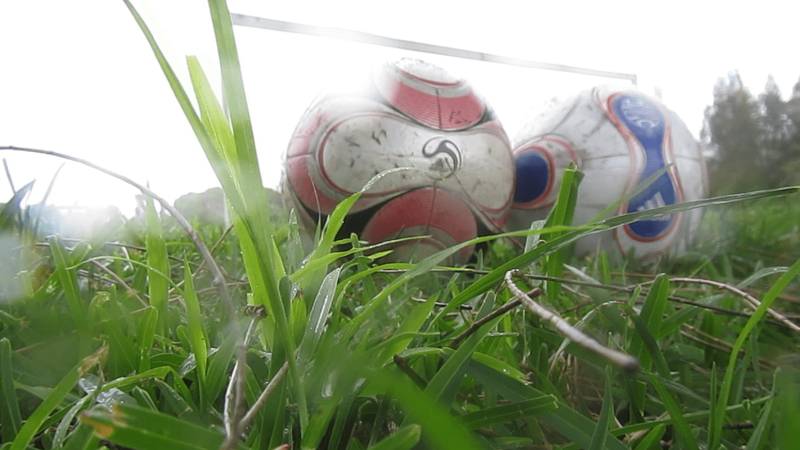 You can still use training balls for games in most youth leagues – the difference is so minimal that most referees won’t notice. For kids, training balls are fine for casual use – they’re generally a bit easier to control, making them a good option for youth players still developing their foundational skills. However, you don’t need to look for training balls specifically – most of Adidas’s glider and replica balls are also perfect for kids. My new ball isn’t completely round – is this normal? When your new ball first arrives, it’ll most likely come uninflated. As you pump it up, you might notice that it isn’t perfectly round. This is quite normal. After your ball has had some air in it for a few days, the creases will begin to disappear. You can still use your ball during this period if you want. 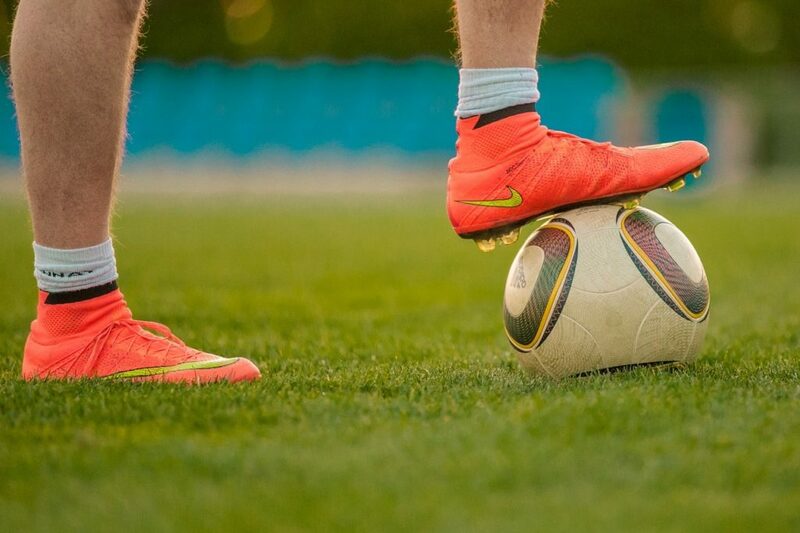 Ultimately, when buying a soccer ball, you will need to consider how often you play soccer and what your budget is. If you’re buying for a child, consider how old they are, what size ball they need, and how seriously they take the sport. For kids, slightly lighter balls are your best bet – but you don’t want to buy something that’s too light, otherwise it’ll fly too far when shot. Still not sure which ball to buy? Let us know in the comments and we’ll get right back to you!